specially reduced prices will apply! Click the book button to find out! Visit the ancient city of Mycenae and the ancient theatre of Epidaurus! You leave Athens westwards and you take a scenic drive, along the coastal road of the Saronic Gulf. In about one hour and twenty minutes you reach the Corinth Canal where you make a short stop for refreshments and also to admire the Canal which connects the two Greek Seas -The Aegean and the Ionian Sea. 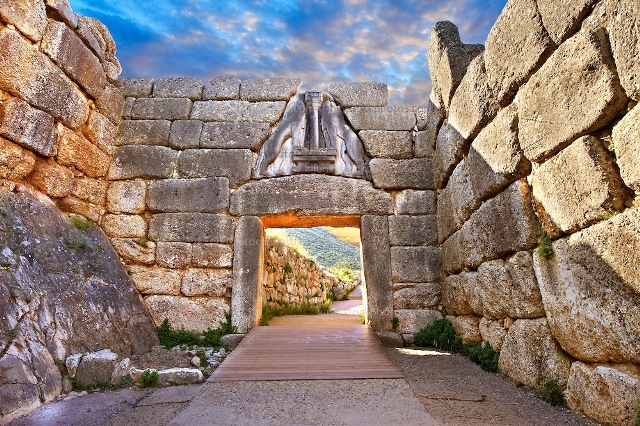 In about one hour drive you will come to the ancient city of Mycenae home to the kingdom of mythical Agamemnon. You will visit the Treasury of Atreus (Tomb of Agamemnon), the Mycenaean Citadel with the Cyclopean Walls and the Lionesses Gate. After lunch a scenic drive through the fertile Argolic valley of orange and lemon groves will bring you to outskirts from the picturesque town of Nafplio where you make a short stop to admire the Palamidi and Acronauplia Hills as well as the Bourtzi island in the middle of the port (during April 1 to October 31, on Tuesday/Thursday departures only, the optional lunch will be provided at Nafplion and you will have the opportunity to explore this marvelous small town). In about 40 minutes drive you reach Epidaurus; this world heritage listed city is reputed to be the birthplace of Apollo's son Asklepios, the healer, and was the most celebrated healing center of the classical world. Epidaurus is probably most famous for its theatre, one of the best preserved classical Greek buildings and still used today due to its amazing acoustics. You depart for Athens which is a good two and a half hour drive including a refreshments’ stop on the way. You arrive to Athens in the late afternoon. There is a pick up service from most centrally located hotels. If you require a pick up service please advise us at the comments section of your reservation and you will receive directions and pick up time by email. Entrance fees are included in the price! The tours do not take place on the public Holidays: 25 & 26 December, New Year's Day, Good Friday, Easter Day, May 1st and March 25, the Greek Independence Day.